Back in 2013, I made a promise to myself, a deep rooted promise to work on becoming the best and creative version of myself. As simple as that promise may sound, it was hard. Very hard. Breaking past those walls and built up false beliefs (about myself, my abilities and my limitations) was certainly a challenge. It didn't happen over night, but in time I eventually broke through that barrier and started to find myself. I started to see my true self shine through. The self that was hidden behind insecurities, ego, and fear for so many years. The process has been a very bumpy but exciting journey. These are the three books that have helped me gain so much inspiration in the beginning stages, ignite that fire inside, and regain my creative confidence. • The Secret- This book was my introduction to the Law of Attraction and using affirmations. And ever since I saw the movie (which I much prefer over the book just because I'm more of a visual person), I'm now a true believer in the power of vision boards and setting intentions. The Secret has taught me to always keep the vision, and trust the process. “There is a truth deep down inside of you that has been waiting for you to discover it, and that truth is this: you deserve all good things life has to offer." • The Alchemist- Wow...just wow. All I can say is that I wish I had read this much sooner. The story and message behind this book is so powerful. I can honestly say that this is one book that has changed my life and way of thinking. 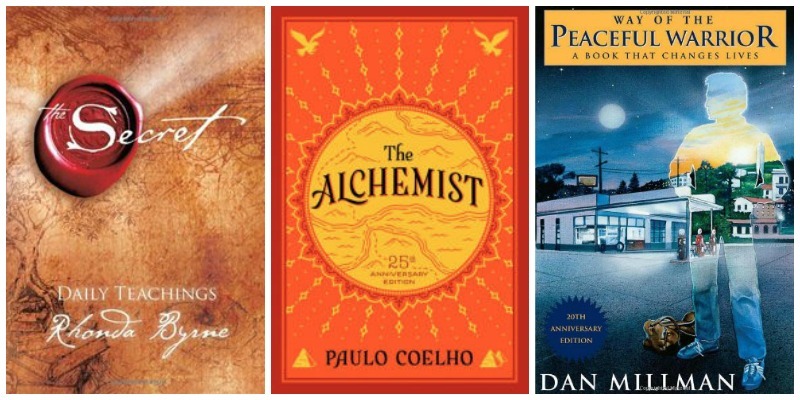 The Alchemist has taught me to never give up and to live out my dreams. • Way of The Peaceful Warrior- This book was a real eye opener and had my mind reflecting on what true happiness means to me. Sometimes what we try so hard to seek is within us all along. Hi Lisa! Yes, you're absolutely right. Once you start the journey it's never the name. It's fun and exciting seeing the different paths and direction life takes us. Ahh, yes. The Power of Now was a great favorite of mine as well. The other two books, I'll most certainly have to look into those. Thank you so much! Good list - I've read all three. My favorite is the last. I think I need to pick it up and read it again! Thanks for the reminder. Great selection of boos. I've read 2 of 3, so I'll be adding The Secret to my reading list. I teally enjoyed The Alchemist!!! I actually just started reading The Secret today. I must say itbia very intriguing and a whole new way of thinking.